This listing is for a super capacitor flash light DIY electronics kit that I designed. It comes with all you need to build a super capacitor flash light, minus a housing! 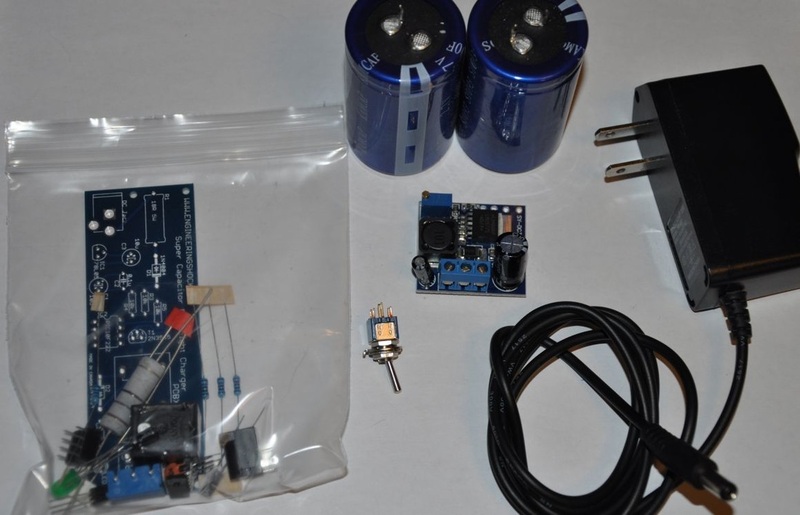 This listing includes two 400f 2.7v super capacitors, a capacitor DIY charger kit, a voltage booster module, a 8-12v LED bank, and a 9v 1000mA wall transformer. In the above video, you will see a demonstration of how all of these parts work together to make a flash light that should never require battery replacements. Super capacitors can be charged and discharged hundreds of thousands of times, where batteries only have a few hundred charge/discharge cycles. As well, unlike batteries, super capacitor do not have a memory. The video below describes the assembly process in fine detail. These videos serve as your instructions. The wall transformer acts to power the charger board, as well as to charge the capacitors. The charger board limits power to the super caps, and acts to turn the charge to the caps on and off, depending on the voltage detected on the caps. When you plug in the board, charging commences (See Video Below). When the voltage on the caps reach roughly 5.33v, the charger stops charging the caps. The power on the caps can be access via the output terminal block. A switch is connected between the positive lead of the capacitor bank via the terminal block to the input of a voltage booster. This voltage booster needs to be calibrated to a voltage using an on board variable resistor. As long as there is at least 3.4v at the input of the voltage booster, then the output can boost to up to 34v. Make sure that before you connect the LED bank, that you tune the output to 8-12v. I suggest 9v (See Video Below). The LED bank is connected to the voltage booster output, where it receives power. When the switch is turned on, the capacitor voltage is connected to the booster voltage, which is then boosted to a higher voltage which can operate the LED bank. Capacitor DIY charger kit - This board serves to charge your capacitor bank up to roughly 5.33v. When charging is complete, the green indicator LED starts flashing, and continues to flash until the user removes power. Once the capacitors are charged, there is no back powering through the device. An internal relay separates the capacitor bank from the rest of the charger board circuitry. Once charged, the bank should stay charged unless it is loaded via the output terminal block. You solder this board together using the below video. Time to heat up the good ole soldering iron! The 9v 1000mA wall transformer: This kit was designed for a 7-9v supply capable of sourcing up to one amp of current. This wall transformer does just that. It acts to power the charger board, and to charge the capacitors. The 2x 400f 2.7v super capacitors: These capacitors will be placed in series, offering a series bank value of 5.4v at 200f. Depending on how you tune your voltage booster, when fully charges, this capacitor bank should offer enough power to keep the flash light running for at least an hour at a time (straight). The Power Switch: This is just a switch that will act to apply power to the voltage booster input. The LED Bank: This bad boy is BRIGHT! It is brightest when operating at 12v. Do not run this at voltages higher than 12v. It is not rated for such voltages. It runs at voltages between 8v and 12v. I like to run it at 9v. I suggest you do the same. We also offer two other variations of this kit. Just check out our store! 1) Just the charger board DIY electronics kit (No transformer/LED bank/Booster/Switch/Caps) The bare minimum. This is if you have your own super caps and other hardware.